How about all the rust this spring? 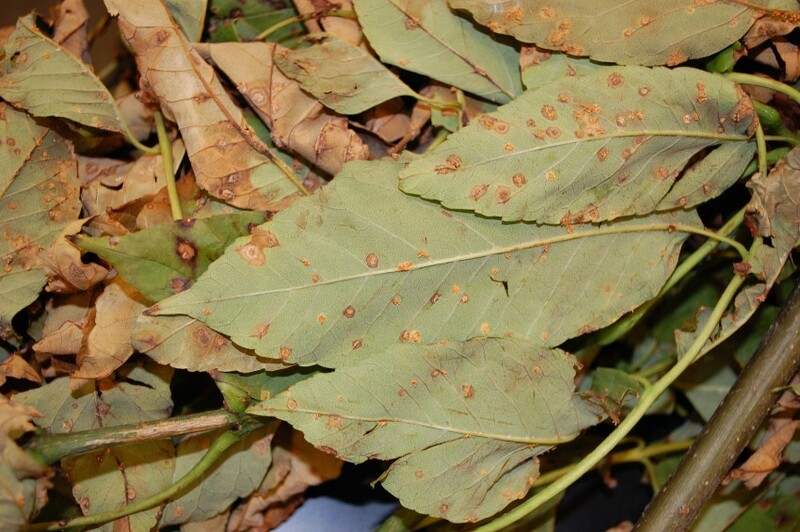 The most common rust disease in the Plant Diagnostic Laboratory by far was ash rust. Our internal Rutgers personals list serve, which functions something like a Rutgers Angie’s List, was lit up with folks complaining about the weird growths on their ash trees. 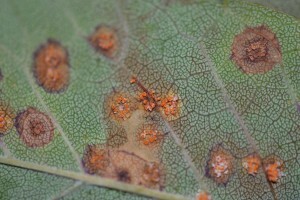 The growths in question were the fruiting bodies (aecia) of the fungus Puccinia sparganioides, which is the cause of ash rust. Leaf spots caused by the fungus Septoria were also common this year. Septoria leaf spot on dogwood is caused by Septoria cornicola. Septoria leaf spot in dogwood usually does not become severe until mid to late summer, but this may vary depending on spring weather conditions. 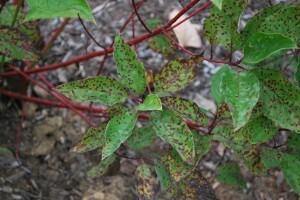 Despite the dramatic appearance of this disease, the overall impact on plant health is minimal. 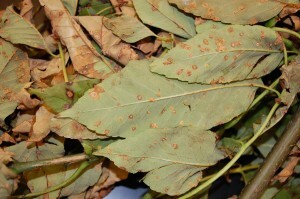 Infected leaves stay on the tree, so despite the necrotic tissue, there is enough green tissue to produce adequate carbohydrate reserves to sustain the plants for the season. Remember that the health impact of a leaf spot on a deciduous tree or shrub is limited to one season. Damaged leaves drop in fall and the plant gets a reset for the following year. 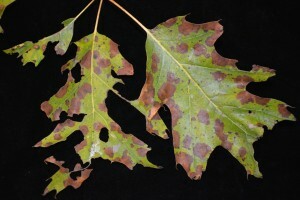 We posted on oaks and bacterial leaf scorch (BLS) a couple weeks ago. Many of these oaks did not have BLS at all, but had a leaf spot disease called Tubakia leaf spot. Tubakia dryina is the cause of this harmless disease. Oak is the primary host, but maple, hickory, pecan, chestnut, redbud, ash, apple, black gum, rose, sassafras, and elm can also be infected. 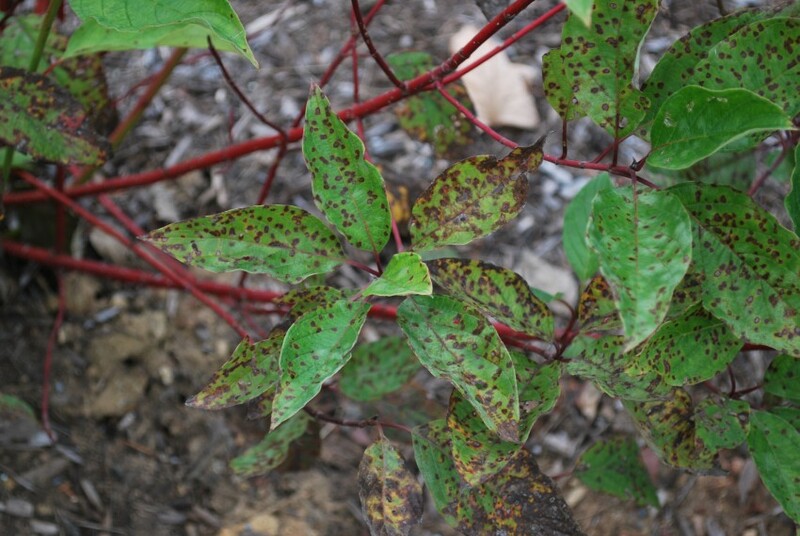 Like Septoria leaf spot on dogwood, Tubakia lesions generally appear in the middle of the summer. Finally, one of my former students brought in elm samples with black spot. Black spot of elm is caused by the fungus Stegophora ulmea. Interestingly enough, despite the appearance of this disease, it is considered an anthracnose disease. 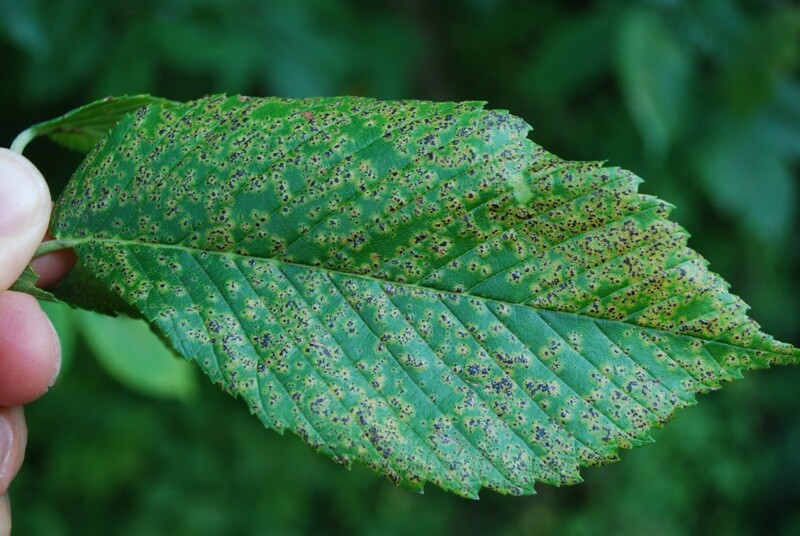 Black spot was the primary problem of American elm before Dutch elm disease. 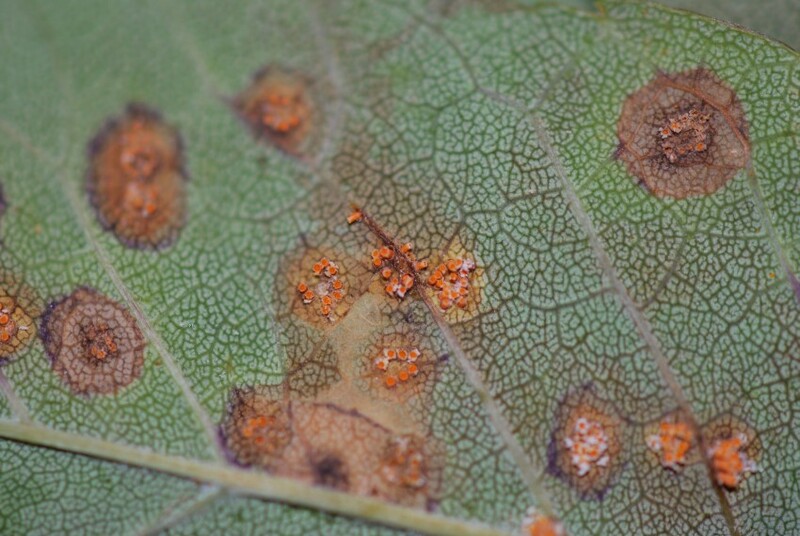 Fungal leaf diseases are common during seasons with abundant spring moisture. As you can see, many of these fungi cause spectacular abnormalities on the plants they infect. Remember that despite the ragged appearance of infected plants, most of the leaf spot diseases have little impact on overall plant health. Ironically, the diseases that hurt the plant the least are the easiest problems to control with fungicide applications. Treatments must be made at budbreak and repeated during the cool and moist days of spring. Good coverage is essential. But why bother with a spray tank if it doesn’t really hurt the tree? Just sit back and enjoy the show!